Pegasus Health was founded in 1992 when a group of Christchurch general practitioners met to see how they could use the ‘health reforms’ of the time to get a better deal for the local community. The early Pegasus pioneers brought together the majority of Christchurch GPs to form an Independent Practitioner Association (IPA) with a strong clinical education foundation and a focus on reducing wastage on unnecessary laboratory tests and prescriptions. The savings achieved went to building a range of programmes and services for patients, such as the first free GP visits for under 5s, free mammography screening for at risk women (before the national programme began), and the PEGS smoking cessation programme (and many more). 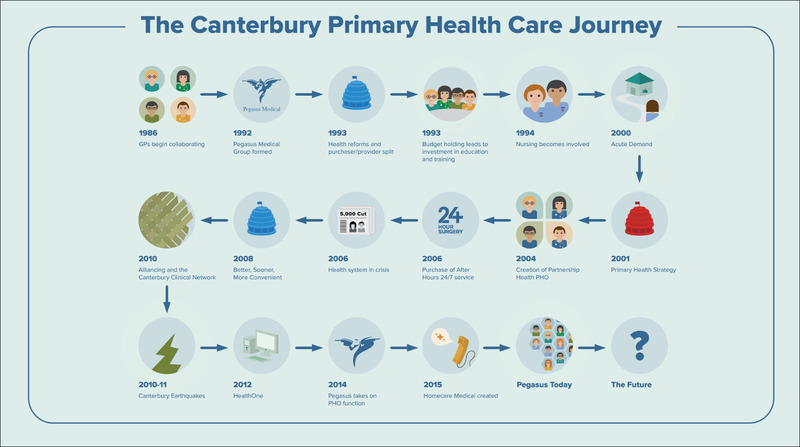 In March 2013, Pegasus Health amalgamated with Partnership Health Canterbury PHO to deliver PHO services across Canterbury, Selwyn and Waimakariri districts. The amalgamation brought together the best of both Pegasus Health and Partnership Health PHO, notably a strong focus on meaningful community engagement, alongside a commitment to providing services that support and promote clinical excellence in primary care. 2017 marks 25 years since Pegasus Health was formed. Click the presentation below for an in-depth look at Pegasus Health and our journey over the last 25 years.